The route, via learning a new technique, to the glue comparison at the end of this article has been somewhat tortuous, but we furniture makers are a pretty pragmatic bunch, prepared to bite the bullet and do some real practical research if it might enable us to realise a design. Having committed to making a prototype chair followed by a set of four to accompany my 'Tree Table', I decided the design would have to fit with the table's naturalistic tree inspiration. What emerged from much measuring and sketching is very organic in form as can be seen from the profile sketch you can see here. The problem was how to make these flowing freeform curves to an acceptable standard of consistency, and with the strength to safely accommodate the flex that is an inevitable part of a relatively light semi-cantilevered structure like this. The table's solid 'C'-shaped steam-bent ash (Fraxinus excelsior) legs had provided proof enough of the unpredictability of steam-bending - all taken from the same tree and made in the same mould, but no two were the same height after bending and drying. That didn't matter too much because I made more than I needed so could pick the best and make adjustments out of sight under the table top. But what you can't have is a chair whose back legs follow randomly different paths on their way from floor to crest rail. A more reliable solution had to be found. The obvious one was structural veneer lamination, but the whole idea of this dining set is that the wood should look as natural and tree-like as possible. 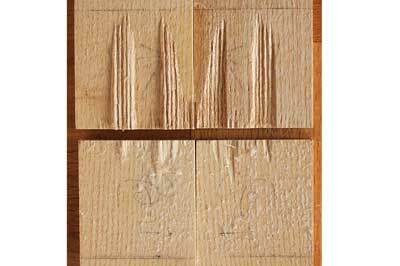 The multiple glue lines of veneer lamination are unattractive and the variation in thickness and profile required would mean many highly visible lateral glue lines on the face as well as the edges. 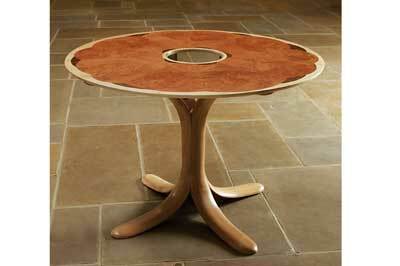 The solution suggested by the late and much lamented Windsor chair maker, Jack Hill, was what he called 'steam-lam'. This technique uses a small number of much thicker consecutively cut steam-bent laminates and gives a much more natural appearance. What's more, it's less prone to failure than one-piece steaming and the stiffening effect of the glue gives much more consistent bends and all but eliminates spring-back. 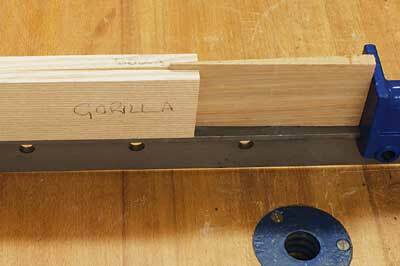 So far, so good, but shaping a three laminate test leg glued with urea formaldehyde - UF - glue, my usual high strength glue of choice, demonstrated that it didn't have the necessary flexibility; a loud crack signifying the failure of a glue line under flexing pressure. 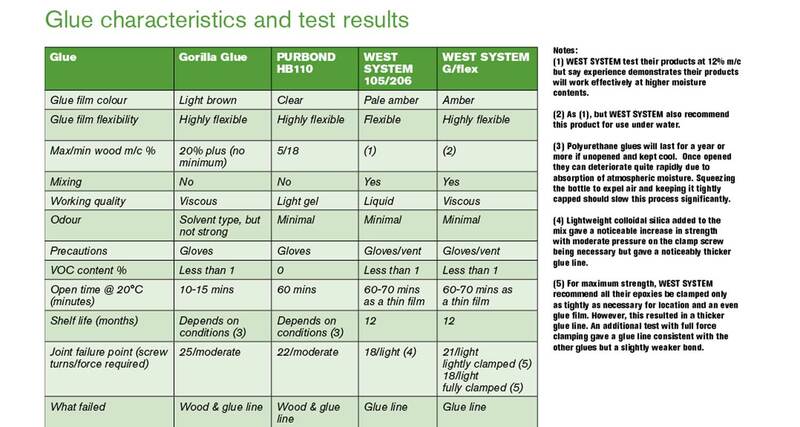 So, if UF glue is unsuitable for applications where the finished glue line needs to flex significantly, which glues are? To answer that question, it's first necessary to understand the steam-lam technique because, for the best results, it requires a different approach to timber selection and preparation and these place quite specific demands on the glue used to bond the laminations. Choice of wood species has to be the starting point. Many species can be steam-bent to a greater or lesser extent, but the most suitable are ring porous hardwoods such as ash, sweet chestnut (Castanea saliva), elm (Ulmus procera) and oak (Quercus spp.). In these, the larger vessels or pores, as cross sections of vessels are called, are localised in the part of the growth ring formed in spring - earlywood - giving a region of more or less open and porous tissue. The rest of the ring, produced in summer - latewood - is made up of smaller vessels and a much greater proportion of wood fibres. The large pores in the earlywood help give these species the ability to take on and retain a new shape when the lignin is softened by heat. A corollary of the marked difference between earlywood and latewood is the prominent grain typical of ring porous woods, particularly when it is sawn tangentially. A naturalistic curve will be enhanced by this prominent grain if it follows the curve, but the opposite is also true, quite apart from the inherent structural weakness of short grain across a component. For steam-bending, the usual advice is to select and process the boards shortly after the tree is felled because timber with high moisture content - m/c - bends more easily and, if constrained while drying, will better retain its shape. 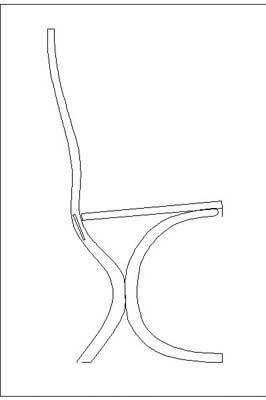 However, this is where we come up against one of the many trade-offs inherent in furniture making. The secret to apparently continuous grain which will disguise glue lines, is to remove as little wood as possible between the laminates. But sawmills are geared to saw wet timber. Their big blades are necessarily thick, have widely spaced teeth with plenty of set and deep gullets to prevent wet sawdust from clogging the kerf and blade, none of which are conducive to minimal material removal. To make matters worse, the poor finish from those big widely spaced teeth means even more wood has to be planed away before the laminates can be glued, to the detriment of grain continuity. For steam-lam, a better compromise is to buy air dried stock at around 15-18% m/c and of a thickness suitable for the finished component allowing for bandsawing the laminates yourself. With finished laminates no more than about 12mm thick and moderate curvatures, air dried stock will bend satisfactorily and can be prepared with much less material loss. To this end, I have been trying the SuperTuff Fastcut variable Choice of wood species has to be the starting point. Many species can be steam-bent to a greater or lesser extent, but the most suitable are ring porous hardwoods such as ash, sweet chestnut (Castanea sativa), elm (Ulmus procera) and oak (Quercus spp.). In these, the larger vessels or pores, as cross sections of vessels are called, are localised in the part of the growth ring formed in spring - earlywood - giving a region of more or less open and porous tissue. 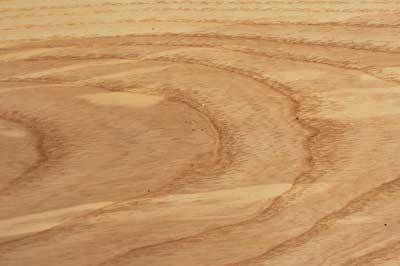 The rest of the ring, produced in summer - latewood - is made up of smaller vessels and a much greater proportion of wood fibres. The large pores in the earlywood help give these species the ability to take on and retain a new shape when the lignin is softened by heat. A corollary of the marked difference between earlywood and latewood is the prominent grain typical of ring porous woods, particularly when it is sawn tangentially. A naturalistic curve will be enhanced by this prominent grain if it follows the curve, but the opposite is also true, quite apart from the inherent structural weakness of short grain across a component. For steam-lam, a better compromise is to buy air dried stock at around 15-18% m/c and of a thickness suitable for the finished component allowing for bandsawing the laminates yourself. With finished laminates no more than about 12mm thick and moderate curvatures, air dried stock will bend satisfactorily and can be prepared with much less material loss. 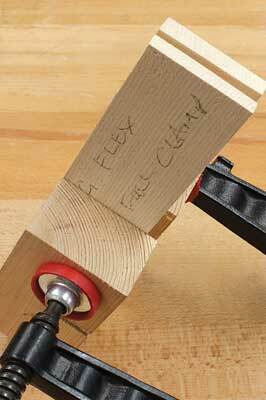 To this end, I have been trying the SuperTuff Fastcut variable pitch blade from ever helpful Tuff Saws. This has hardened teeth whose pitch varies between three and four teeth per inch - tpi - with minimal set, and is made from thinner stock than usual - .055mm compared with .08mm for a standard blade. The result is said to be the ability to cut stock up to around 230mm wide with a finish equivalent to that achievable with a 6tpi blade on much narrower stock. One of the reasons given for this finish level is the reduction in blade resonance attributed to the variable pitch. The results are certainly impressive. The cut is very smooth, requiring little effort and with no sign of clogging with wood at 18% m/c. The kerf is only 1mm wide and the finish almost good enough to give an invisible glue line. The lightest of skims on both cut surfaces gave a perfect gluing surface with the loss of only another .5mm of material. This overall loss of 1.5mm is less than half what might be expected from conventionally sawn boards. 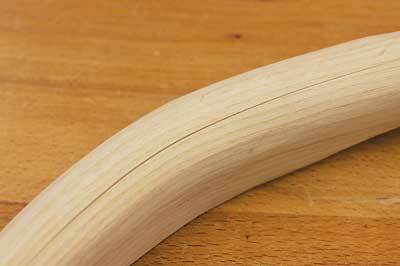 Skimming is best done on a thicknesser rather than a planer because it gives a better finish and there is no need to remove any bend if you're going to bend the wood anyway, just orientate the bend to suit the curve you want. Choosing the right blade is a good starting point, but results like this are only achievable with good bandsaw setup and the right technique. A little time spent checking blade tension and blade guide and thrust bearing settings, will more than repay the effort. Technique starts with maintaining completely consistent pressure against the fence throughout the cut and a featherboard is much the best way to achieve this. The other important aspect of technique is ensuring correct and consistent feed rate with no stops to change hands or pick up a push stick, for example. Using a featherboard makes this a lot easier because your hands are relieved of the job of maintaining sideways pressure, but organisation and the correct stance for a smooth continuous cut are also important things to consider. 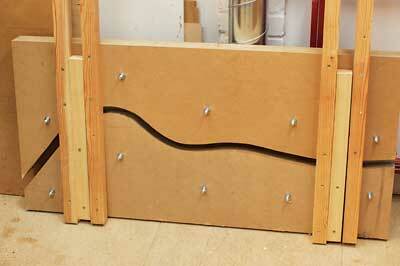 For this you need a steam box, a wallpaper stripper to provide the steam and moulds to form and hold the curves. 30 minutes steaming at full temperature is about right for 12mm thick stock. 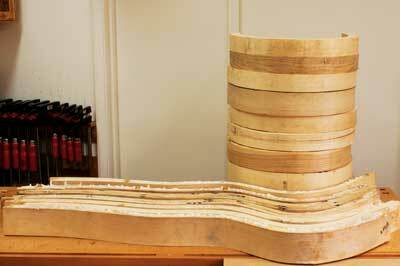 Matching male and female moulds are pretty much essential for complex curves because speed is of the essence once components come out of the steamer, and there won't be enough time to put on masses of clamps and blocks around each section of the curve. Ideally, have a small group of people to apply as many sash cramps as you can muster. 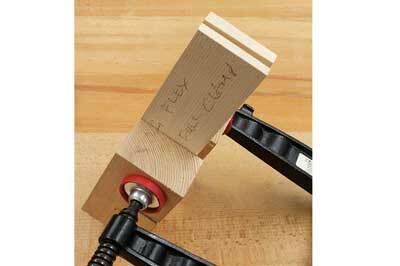 Once the components have cooled down, they can be glued and re-clamped. However, the problem with this is that unless you have lots of moulds, a mountain of sash cramps and acres of bench space you won't be able bend many sets of components in one day. Being able only to muster my wife to help on a regular basis, I have found that bending one laminate at a time, unclamping and adding the second to the first and then the third to the first and second, is quite feasible with only two people and some careful forward planning. The inevitable inaccuracy arising from bending only one and then two laminates in a mould intended for three seems not to affect the quality of the final glued component because the relatively thin sections have enough flexibility to adjust as necessary. Steam-lam requires a glue that can cope with wood moisture content of 15-20% and a glue line which can flex without failing but won't allow creep. As already mentioned, that eliminates UF glues but it also eliminates PVAs and aliphatics which may allow some creep but, more importantly, won't form a bond if the wood m/c is too high. For example, Titebond III glue is not recommended where m/c exceeds 12%. That leaves epoxies and polyurethanes which are claimed to be able to cope with higher than normal m/c and offer some flexibility at the glue line. I put two of each through a comparative test. 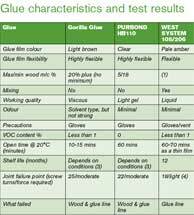 The polyurethanes were PURBOND HB110, which is widely used in large scale structural lamination, and Gorilla Glue. The epoxies, both from WEST SYSTEM, were their standard 105 resin/206 hardener combination and 655-K G/flex kit. 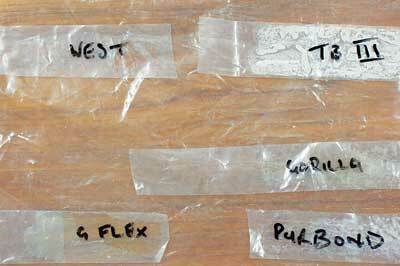 G/flex is thickened and claimed to be both entirely waterproof and more flexible than 105/206. The test used machine planed ash blanks, 160 x 60 x 10mm, moisture content 14-15% approx. Pairs of blanks were prepared by marking off a 60mm square at one end of each, a taper was then formed on the remaining 100mm length so that when the flat 60mm faces were brought together there was a 5mm - approximately - gap between the two opposite ends of the blanks. Glue was applied to the 60mm squares as recommended by the manufacturer and clamped as tightly as possible using an 'F' clamp and pressure blocks - but see note (3) on the grid opposite. Test pieces were left clamped for 24 hours and unclamped for a further 24 hours before testing. Glued test pieces were set up on a sash cramp, with an oak wedge introduced into the 5mm gap so that it made light contact with both sides of the test piece. The sash cramp was then tightened, counting the number of complete turns of the screw required until the glued joint failed completely. The force required to turn the screw was also subjectively noted. 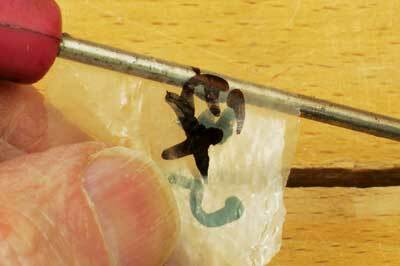 To test flexibility glue was clamped between plastic sheet and then the resulting film peeled off and wrapped around a 3mm-thick screwdriver to see if it would break. 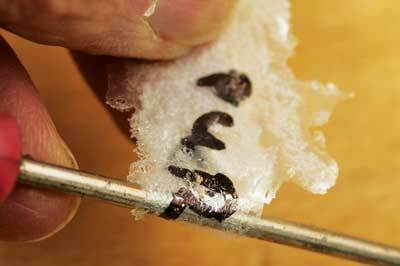 All passed this test easily, so are more than flexible enough for any likely steam-lam application. This test was quite a tough one. The peeling apart action of the wedge test is probably more demanding than what most laminated components would be subjected to. The polyurethanes proved to be stronger than the epoxies when used in the same way. 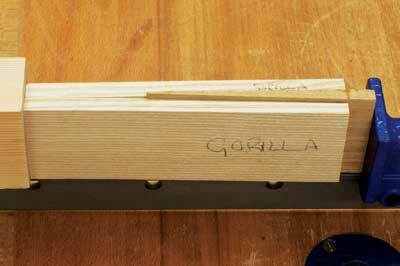 Both polyurethanes were as strong as the wood, with Gorilla Glue having a slight advantage, but I'm confident, on the basis of this test, that all the glues would have sufficient strength and flexibility for steam-lam bonding. Back in the real world of making, PURBOND HB110 is the clear overall winner. It requires no mixing, and its light gel consistency - a bit like wallpaper paste - and long open time make it easily the most pleasant to work with. Its colourless transparency means it will be invisible on any wood. The only downside is that it's not available from UK suppliers but it can be bought direct from the makers in Switzerland in 800g bottles. I now have a pile of front and back legs glued with PURBOND HB110 and have done some shaping and flexing to back up the test results; just the crest rails and back splats to go now, plus a few hundred hours of jointing and shaping!